Swamps are mysterious in nature, often representing dark places that border far more on the alien than the familiar. In The Empire Strikes Back, Luke Skywalker must travel to the swamp planet of Dagobah, where his very approach to the surface is clouded in fog and the land seems perpetually stuck in twilight. On Dagobah, he meets Yoda, a wise seer who trains him to understand the world around him through its interconnections via the Force. At one particular point, Luke confronts his own inner turmoil in a vision of himself as Darth Vader, and later, experiences a vision of the future. 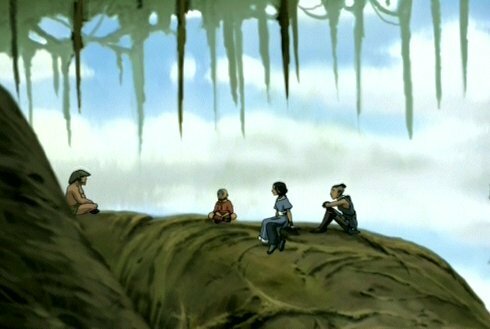 “The Swamp” represents Aang’s, Sokka’s, and Katara’s own trip to Dagobah, where Aang specifically steps into the role of Luke and gains insight into the world around him, while also glimpsing the future. It’s not entirely just about Aang, as we are allowed to pull aside the curtains to peek at the inner feelings of our Water Tribe siblings, most poignantly with Sokka who has not left the events of the Northern Water Tribe behind him. At the same time, we are provided with an extremely short story of Iroh and Zuko, begging on the streets of an unnamed Earth Kingdom village, that also provides some insight into Zuko’s continuing transition from who he was as an exiled Fire Nation prince to who he will become. The episode begins with Zuko and Iroh seated on the edge of a street in the aforementioned town. 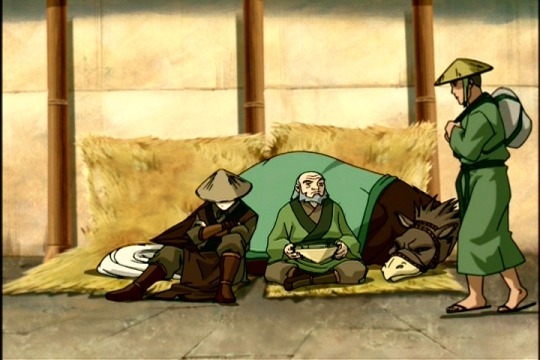 Zuko’s hat covered head hangs, while Iroh holds his hat upside down on his lap as a container for offerings. His eyes follow every passerby, including a merchant pulling a cart with various masks on display, including the familiar mask used by the Blue Spirit in Season 1. Yes, that’s foreshadowing, but subtle and one this reviewer admits to have completely missed the first time watching the episode. After several kind souls drop some coins into Iroh’s hat, Zuko bitterly complains that as royalty, people should simply be giving them what they need. It’s not coincidence that this statement is made with the ostrich horse that Zuko stole seated behind them both. Zuko may have severed his connections to the Fire Nation, but he has not yet severed himself completely from his identity as a Fire Nation prince. The next passerby is a cocky looking fellow with two swords strapped to his back. He demands Iroh to perform for him to earn a gold piece. Our former Fire Nation general launches into a sweet song about the women of Ba Sing Se, but the swordsman remains a critic and begins to slash at Iroh’s feet with his weapons to make him dance. It’s the martial art equivalent of the bad guy in a Western shooting at the feet of an unfortunate soul, “Dance partner!” A definite feeling of the Old West does begin to creep into the visual and thematic style of the Earth Kingdom villages for part of this season, specifically for Zuko’s on going stories, and this is an effective way to introduce it with such an allusion. Iroh earns his coins, the man laughs and makes a disparaging remark about fat men dancing for their meals. Zuko says nothing, but watches the swordsman walk away. The story of Iroh and Zuko is then placed on hold while Team Avatar’s journey into the swamp unfolds. 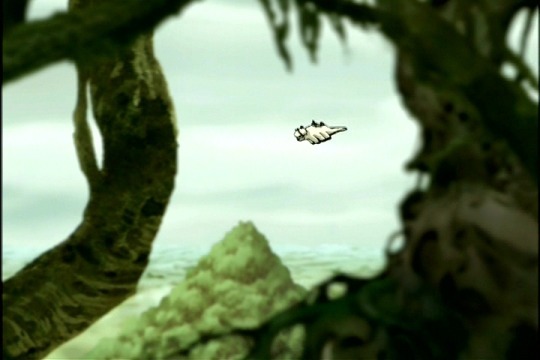 Appa flies through a blue and cloudy sky with Aang at his reins, though the air bender seems to almost be falling into a trance as he gazes down at the sunlight reflecting off the water in a swamp below. Without consciously realizing it, he guides Appa lower and lower, until Sokka questions Aang as to the why of this decision. By then, it’s too late, and a freak tornado appears from nowhere and hurls everyone down into the swamp. Appa and Momo find themselves separated from Aang, Katara and Sokka, and all five begin to make their way through the swamp they now find themselves lost within. Immediately, Aang senses the overwhelming life of the swamp, cautioning Sokka to stop cutting away at vines with his sword. Eventually night falls and the trio huddle around a campfire, perched on top of a giant root. Katara slips in a line inspired straight out of Empire, “Does anyone else get the feeling that we’re being watched?” Except, unlike Luke who finds a small green person waiting behind him, there is nothing but darkness until the next day when all three are unceremoniously yanked away by giant vines. Then with each hero alone in the depths of the swamp, visions appear that inform us a bit more on what some of the strongest feelings are within their characters. 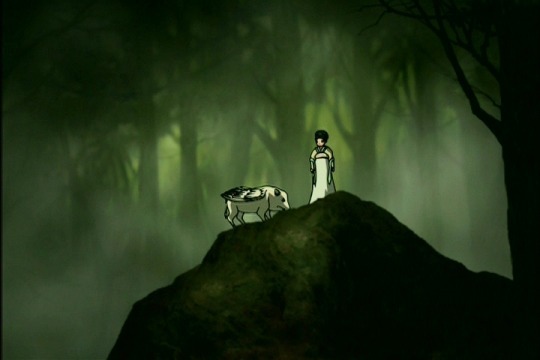 Katara sees her mother, standing off in the middle of a glade. Excited, the waterbender rushes forward only to find her mother was really a stump. Early in Season 1, be it in “Jet” or in “Imprisoned,” one of the defining elements of Katara’s personality was the loss of her mother. Not only as the significant loss a parent would have on a child, but also to a degree in how it shaped her personality and life after her death. Katara had to become a mother figure for both herself and for Sokka, and her necklace remains one of her most prized possessions. It’s no surprise, then, that in the swamp, Katara sees one of the most important people in her life, who’s absence dramatically changed who she is as a person. Sokka, meanwhile, has a vision of Yue. 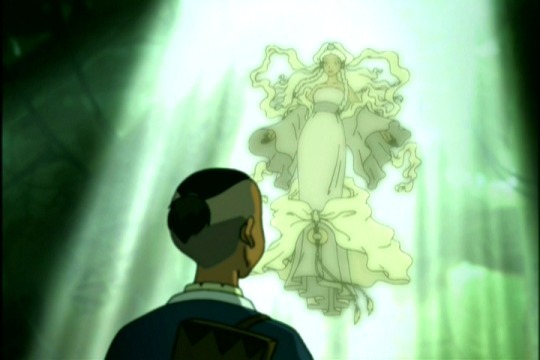 The last time we saw Yue, she had become a spirit of the moon, after physically dying in Sokka’s arms. Her parting then was bittersweet, as she forgave Sokka of the guilt he brought upon himself for failing to keep her safe. Now, as she appeared before him, she chastised Sokka for failing to do just that. Before Sokka can reach her, she disappears, only to momentarily reappear immediately behind him, before vanishing for good. Of all three heroes, this vision is the most poignant, as it drew upon Sokka’s own inner feelings and thoughts. It’s made painfully clear to us viewers that Sokka still misses Yue, unsurprisingly, but also still blames himself for her death. For how long Sokka carries the pain of this belief is unknown, but it’s a powerful moment of character development for the Southern Water Tribe warrior and for the show overall. Finally, Aang has a vision of someone he has never met. A girl in fancy robes accompanied by a pig with wings. Aang attempts to reach her, but she eludes him, laughing to herself the entire time, before disappearing completely. It’s an intriguing scene and one that will pay off only two episodes down the line, but it’s also significant in the greater Avatar world. It lays the groundwork for a significant callback in the future of The Legend of Korra, which plays wonderfully on the lesson taught later in this episode, that visions can be of people not yet met or loved ones. 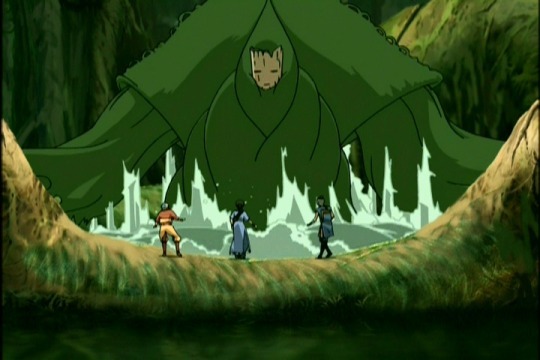 But that’s the future, and in the present, Aang, Katara and Sokka are reunited when a swamp vine monster attacks. The design of the monster has a striking resemblance to a creature one might find staying at the hot springs resort in Spirited Away or as to put it another way, in a Hayao Miyazaki film. While Sokka proves to be mostly useless against the giant creature made of vines and Aang performs reasonably well, the true stand out is Katara. Her mastery of water bending is placed on incredible display as she uses multiple forms of attack against the creature, and finally defeats it after Sokka points out that a man is inside. In fact, the man is bending the vines via the water inside them (an idea that comes back to the show with an incredible and terrible vengeance in Season Three). Defeated, the man turns out to be a native, generally only there to attack those who hurt the swamp (SOKKA), but he’s also our fill in Yoda and Buddha. 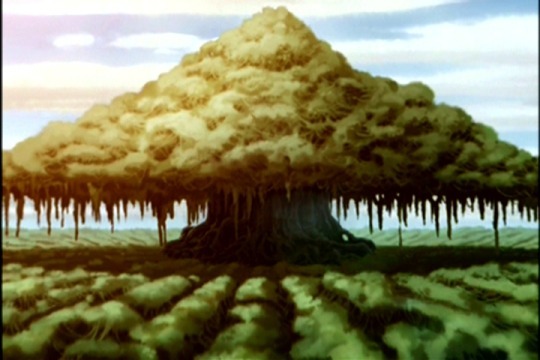 Huu also instructs Aang that everyone and everything is connected, in the same way that the swamp is one giant living organism with every tree part of the same tree. For Empire fans, this might remind them of Yoda’s lesson to Luke about the Force and how it flows through everything, connecting it all. It’s this same type of connection that allows Aang to then touch a root and see where Momo and Appa are located. He finds them in danger. In the midst of the three heroes’ adventure in the swamp, Appa and Momo had run foul against what might be best called Swamp People who speak with heavy southern accents. Shockingly, they are also water benders and were in the process of wrapping up Appa for dinner when Aang, Katara, Sokka and Huu arrive to sort things out. The events of the sky bison and flying lemur were in themselves entertaining, though neither Appa nor Momo seemed to come across a transformative moment of their own. With all sides declared and friends made, we get to leave Team Avatar with the joy of company and a better understanding of the world. Elsewhere on the same continent, Zuko decides to make his own impact on reality. Night has fallen on the village where Zuko and Iroh were panhandling and the swordsman from earlier walks confidently alone through an alley way until a sound startles him. Slightly shaken, but embolden by his two swords, he unsheathes them and challenges whomever it might be. His challenge is accepted and within seconds, he is unconscious on the ground and his swords in the hands of his attacker, the Blue Spirit. A sword wielding Blue Spirit is the final frame we see for “The Swamp,” and it’s a fascinating way the writers chose to bookend the episode. In the beginning, Zuko complains that they should be given what they need based on their royal status. The ostrich horse seated behind him and Iroh is proof enough that Zuko recently felt the same way and acted upon it. 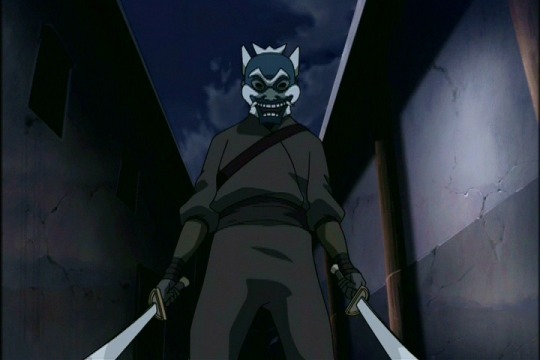 Yet, here in the dark, when Zuko chooses to take the swords, which serve the purpose of helping to arm him when he cannot use the fire bending that would mark him a member of the Fire Nation, he dons the mask of the Blue Spirit. He could have done exactly the same without the mask in the same way he stole the ostrich horse without one. He had to do it as the Blue Spirit. 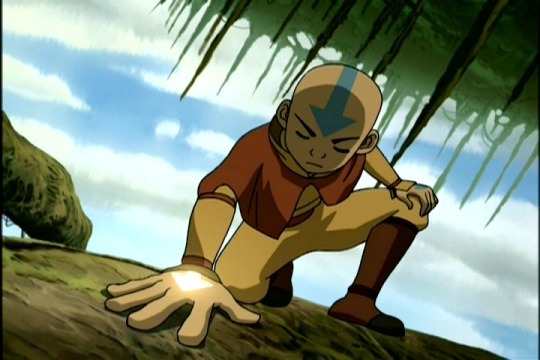 In Season One, “The Blue Spirit,” was Zuko’s alter ego to do what he could not do as a Fire Nation prince, which was to break into Commander Zhao’s fortress and free the avatar. Thus, Blue Spirit is his way of being allowed to act out in ways he cannot personally act out without the mask on. The fact that Zuko wore the mask in this case shows that he cannot bring himself, as Zuko, to simply take what is not his, even if it belongs to a guy who’s basically a jerk. It’s a complete reversal from “The Blue Spirit,” as this time, he wants to act like the Fire Nation royalty that he is, but he cannot bring himself to do it, where in last time, he could not act the way he wanted because of his status. It’s another step forward in Zuko’s rehabilitation from villain to hero. On a side note, read the graphic novel, Avatar: The Last Airbender – The Search, for a touching reason why the Blue Spirit mask is significant to Zuko. The swamp is a mysterious place where everything can appear the same, but at the same time, always changing, as things live and move, grow and die. For our heroes, and Aang in particular, it served as a place of learning about the world and his own future. It’s their Dagobah, complete with a short squat guy spreading advice about how everything is connected.